The 53-acre solar farm cost $11 million and, on a good day, will generate 5.8 megawatts of clean, renewable electricity. 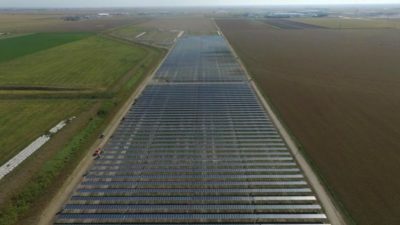 The project is a partnership between the city, Nebraska Public Power District and Chicago-based SoCore Energy, which has built hundreds of solar arrays, mostly on the roofs of large buildings. [Russell] Young, SoCore’s vice president of operations, said Kearney’s project is his company’s largest, but as the cost of building solar farms declines, he is confident SoCore will be building more like the one at Kearney’s Tech oNE Crossing. Request Community Solar In Your Community: In addition to Kearney, participating communities in NPPD’s SunWise Program include Venango and Scottsbluff. If you are an NPPD customer who lives in another town or city and would like to request community solar in your community, click here to submit the SunWise Community Solar Interest Form. 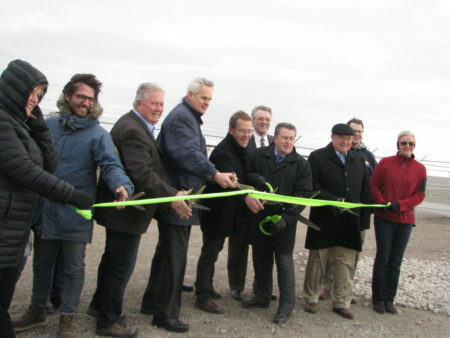 This entry was posted in Community-Scale Solar, Nebraska / Midwest News and tagged Community Battery Systems, Kearney Community Solar Farm, Kearney Hub, Kearney's Tech oNE Crossing Technology Park, Mike Konz, Nebraska Public Power District (NPPD), NPPD's SunWise Community Solar Program on December 12, 2017 by Helen Deffenbacher.